This is not a joke but it is nice to start something new. 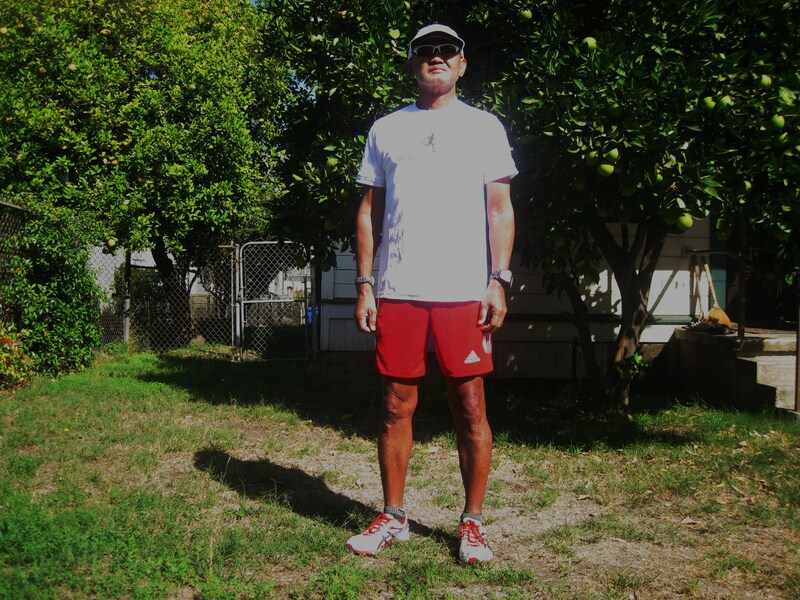 Starting on my fifth year, I will be featuring pictures of me in my running attire and who knows other runners will be featured in this blog in their favorite “running kits”, too! You have to excuse me for being an amateur in my picture as this was taken from the self-timer of my old Canon IXUS Digital Camera with the backyard of our house in Los Angeles. I hope things will improve on the quality of the pictures to be published in the future posts. Yes, this is a copycat of the popular “The Sartorialist” which is now considered as a multi-million dollar worth fashion blog in the Internet. I am not saying that this blog will be after the concept of showing pictures of runners with the ultimate purpose of raising some money. But who knows? This could be another option where one can raise funds to support our elite runners for international exposure. There is only one way to find out but to start and take the first step, so to speak! Next time, the published pictures will just be pictures without any description. And there will be NO make-up or “photoshop” refinement of each picture. The more you are messed up with your sweat, the better! If you can not make it with speed, finish your race and flaunt your nice running apparel! Who will be the next model? You can make a comment in this post if you are interested. Good luck to those who will be joining the 2012 New York City Marathon this Sunday! Run Happy! Suddenly, my Garmin Forerunner 305 did not respond as I pressed the Power Button yesterday morning after charging it the night before. I took me some time to figure out what was wrong with my Garmin. I was sad and frustrated to see my GF 305 was not working after my daughter brought it here in the country from the USA last February of this year. Instead of having my running workout, I opted to go to the gym and had my supplementary weight training. Last night, I remember what Mark FB suggested to me in one of his comments about having a link with www.motionbased.com and visit the Forum section for any problems with the use of the Garmin Watch. That was what I did and I read questions among Garmin users on problems they encounter with their watches. Such problems are being answered by other users who had experienced such problems with their watches. I was glad that there were users in the said forum who experienced the same problem with my Garmin. One post suggested to press the Mode and Lap Buttons at the same time, holding it for a few seconds. That was what I did while my GF 305 was connected to my laptop’s USB port. And suddenly, my watch responded and the watch dial displayed that my watch was on “charging” mode. It felt good that my GF 305 is working again. To all the runners who are using Garmin Forerunner, it is suggested that you visit the Forum section of the abovementioned website to find out more about your watch and acquire solutions to problems you encounter with your Garmin Watch. To Mark FB, thanks for the “tip”. 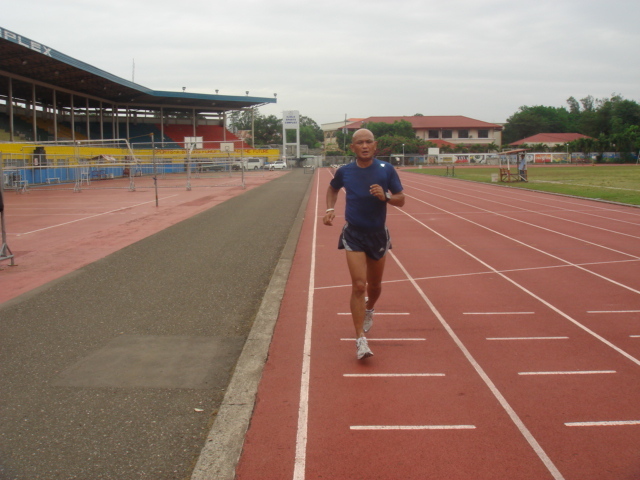 The Iloilo City Sports Complex Oval Track is longer from what I’ve expected. Oval tracks are supposed to be 400 meters or 440 yards on its innermost lane. 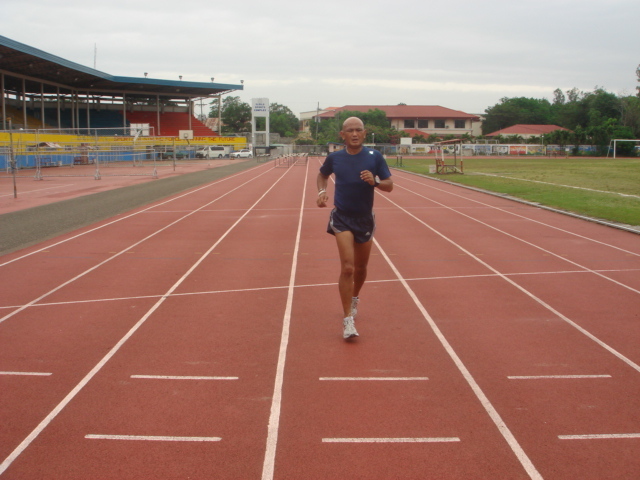 The Iloilo City Oval Track has eight (8) lanes. After stretching and warm-up for one lap around the track, I started to run four laps at the innermost lane (Lane # 1), then to the outermost lane (Lane # 8), then to the middle lane (Lane # 5), and made two continuous laps (800 meters) at Lane # 1 in order to finally determine the actual distance of the Oval. After running 800 meters, I ran another 800 meters for my cool-down run. I finished my running workout with stretching. 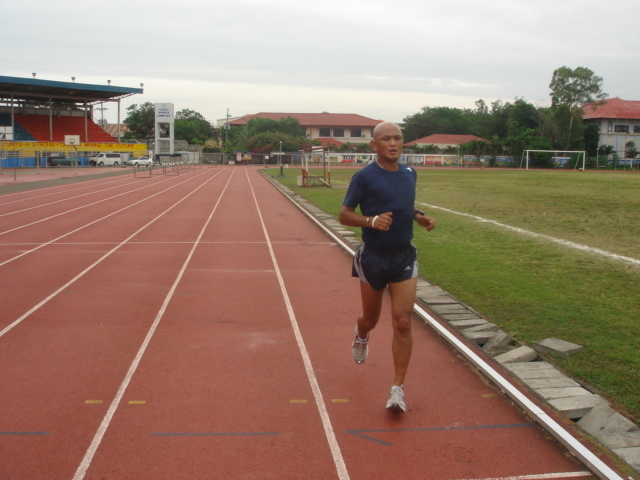 Overall, I was able to run 17 laps which is equivalent to 6.8 kilometers or 4.25 miles. 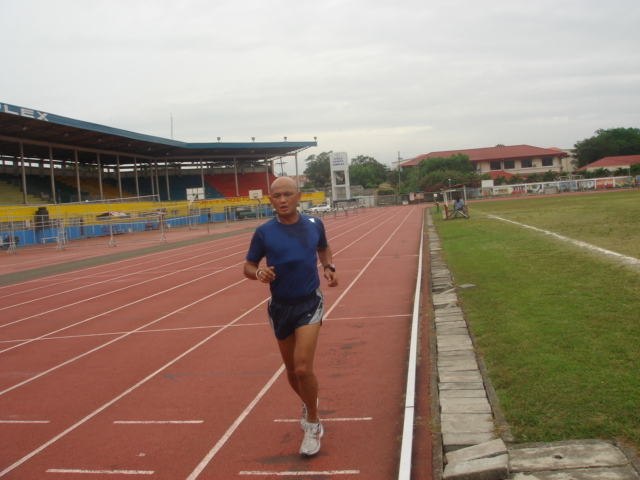 Definitely, The Iloilo City Sports Complex Oval Track is longer than the normal oval track as determined by my GF 305! 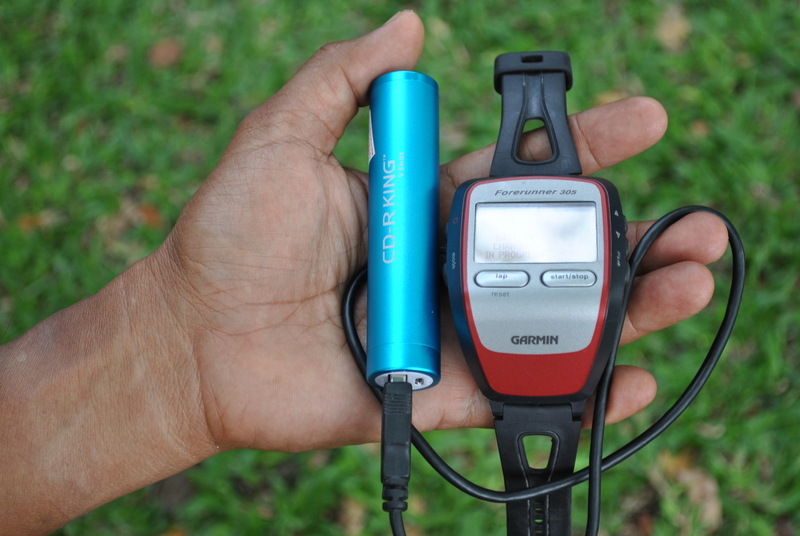 I had my run in Jamindan and tried to use my GF 305 while running along the 2-mile route inside the camp. Although it was raining the whole morning, I made a decision already to run on this day excited to use the GF 305. So, I waited for the rains to stop before deciding to run. I finally started running at 10:47 AM after doing my stretching exercises. I finished my run with a one-mile slow and cool-down jog. Total distance covered in my run was 7 miles or 11.2 kilometers. From the GPS readings of my GF 305, I found out that the 2-mile loop I had been running for the past months in my camp in Jamindan is short by almost 300 meters! I had to run an additional distance for the lacking meters and stopped every lap once the GF 305 registers a distance of 2.0 miles! My “soldiers” will have a lot of explaining to do! Well, to finally validate the accuracy of my GF 305, I need to run along the Iloilo City Oval Track in the next coming days.